2017 was the first year Americans’ charitable contributions crossed the $400 Billion mark. Why is giving on the rise? There are many contributing factors to this increase, but one direct result we are seeing is an increase in creative giving holidays or occasions to give. Now, we not only have innumerable organizations and causes to support, but fundraising efforts are often centered around a “day”, like a day of giving, or a campaign that culminates on a particular day. This strategy helps donors know that there’s a date to aim for, an urgency to give to be a part of the campaign or a “deadline”; but can also help organizations to focus & target their efforts and become more effective. This can also help from a reporting perspective, allowing easier year-over-year comparisons and increases to be more measurable. And of course, it inspires competition and creativity while tapping into our seemingly-innate need for gamification. Giving Tuesday (#GivingTuesday) is by far the most well-known day of giving. It was founded in 2012 by The 92nd Street Y and the United Nations Foundation, as a sort of a movement to reduce the focus on consumerism and refocus society on giving back. Not accidentally, it falls between Black Friday and Cyber Monday, on the Tuesday after Thanksgiving in the U.S. Giving Tuesday, not surprisingly, coincided with an increase in the popularity of Giving Days. Giving Days, more generally, are 24-hour fundraising campaigns, which focus on rallying groups or organizations in their fundraising efforts. These can be regional, cause-based, or focused around educational institutions’ fundraising efforts. The Giving Day concept was around, and there were software solutions specializing in it, even before Giving Tuesday was born. It’s a natural marriage, and technologies have rallied around their growth. The transaction volume can be tremendous, as can the returns, but the technology needs to be able to scale. Just like there are specific technologies around Peer-to-Peer fundraising, fundraising event management, and Advocacy, Giving Days have unique requirements and idiosyncrasies when it comes to technology. Different types of organizations do Giving Days differently, and we’ll focus on a few of them below. To be sure, Community Foundations’ Giving Days make up the bulk of what we see today. Community Foundations are grant-making organizations that focus on improving lives or communities within a particular geographic area. Some cover large areas, while some are focused on counties, but they typically are affiliated with a large number of smaller nonprofit organizations in the area. During a Giving Day, these organizations engage in their own fundraising efforts, using the same technology platform that the Community Foundation has set up, so that there is one “clock”, and one larger effort, but the organizations rally around their own localized cause. Imagine animal rescue organizations, community health organizations, homeless shelters, etc. all raising funds on the same day, using the same tools. They sign up to participate, and create their own accounts using the Community Foundation’s Giving Day “instance”. That way, all the funds raised on that day get tallied up to the same total; and they can compete with one another for challenge grants. This is the heart of a Giving Day, and what has become incredibly successful. With Community Foundations, the heavy lifting is typically done by the Community Foundation, and participating nonprofits go through a registration/approval process, and provided with all the tools they need, in order to promote and run their own piece of the event. There have been some incredibly-successful giving Days, both on and around Giving Tuesday, and there are more and more organizations focusing their Giving Days around this date. Higher Education is another area in which Giving Days have seen great success. Raising millions of dollars in a single 24-hour period can be quite attractive to a University, but requires coordination, and a platform that can handle the volume. Since Universities’ individual colleges and departments can often function as silos, some creative marketing has often been used on campuses to promote the events. Higher Education events are typically different in that they’ve often planned the event in advance, in terms of which departments or colleges will participate. So, there’s already an understanding of what the goals are, and less of an “I want to participate. What do I do?” scenario. Because colleges can be competitive, there is often a great deal of focus on leaderboards, and gamification in this space. As you can imagine, branding, logos, and reporting on results are important here, maybe even more so than in Community Foundations. Some of the challenges in this space include reporting, gift designations, and of course, SCALE. There are very few platforms that can handle the scale of hundreds of thousands of transactions in a single day. Standard donation forms, when faced with concentrated volume, will typically fail. There are a lot of moving pieces, and parties involved. Handling the transactions is one aspect of it, however processing those transactions through a merchant account is another. Handling card declines, transaction timeouts, refunds, and reconciliation are of the utmost importance and are just a few of the challenges. The website itself needs to be able to handle the scale too. Imagine not only the huge spike in site visitors but also in the rendering and submitting of the multiple forms, from the multiple participating organizations’ donation pages, all within a 24-hour period. This means that the selection of a vendor is of paramount importance. If your organization is considering having a Giving Day, Giving Tuesday is a great day to have it! You can harness the momentum Giving Tuesday has inspired, and you’ve got some built-in publicity, but make sure you don’t try to host a Giving Day on a platform not designed to handle it. There are definitely downstream effects of an unsuccessful fundraising campaign, in addition to the obvious, more immediate effects. Make sure the vendor & platform you choose is truly designed to host Giving Days, and that the vendor has deep experience in this space, lest you get the wrong type of publicity and potentially lose donor trust, as well as the trust of participating organizations, should you be the organization hosting it. 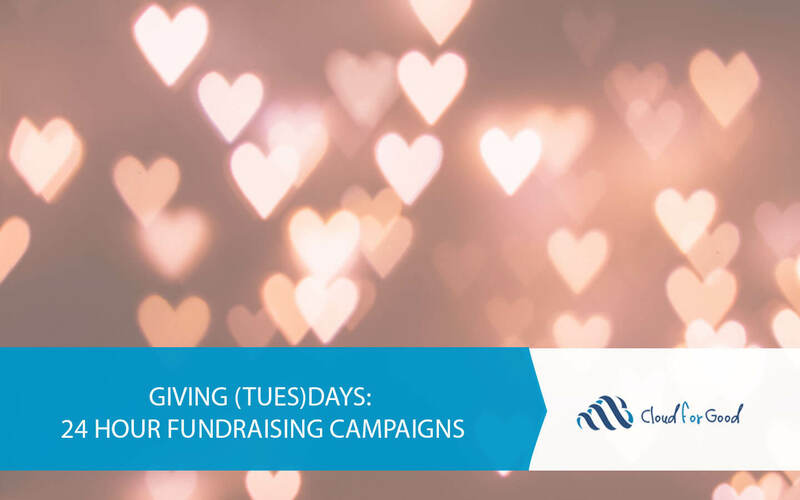 Although Giving Tuesday can be a lot of work upfront from preparing for the day with your marketing team, organization-wide participation and day of heavy traffic, the results and rewards from a successful Giving Day campaign can excite and motivate your staff, trustees, and donors of all size!